What is in the match table? The Generate Rubbersheet Links, Transfer Attributes, and Detect Feature Changes tools use feature matching techniques to identify corresponding features and produce various results. This document describes the feature matching process and explains feature matching information found in the match table. Feature matching means finding corresponding features from two similar datasets based on a search distance. One of the datasets is named source and the other target, especially when the feature matching is used to derive rubbersheet links or to transfer attributes from source to target data. These datasets overlap each other but are not perfectly aligned due to inconsistent data collection, changes over time, or other reasons. Figure 1 shows an example of streets, where the source features come from a commercial data provider and the target features are built and maintained by a city government. The feature matching process analyzes the source and target topology, detects certain feature patterns, matches the patterns, and matches features within the patterns. The accuracy of feature matching depends on data similarity, complexity, and quality. In general, the more similar the two datasets, the better matching results. Normally, a high percentage of successful matching can be achieved, while uncertainty and errors may occur and require postinspection and corrections. Feature attributes can optionally help determine the right match in feature matching. 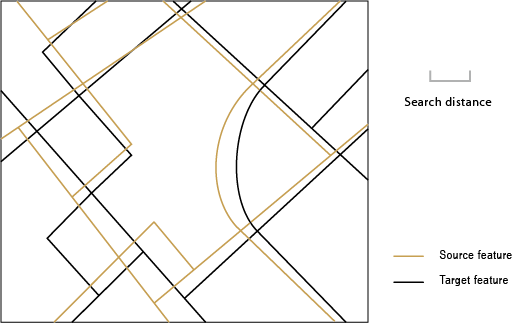 If one or more pairs of match fields are specified, spatially matched features are checked against the match fields. For example, if one source feature spatially matches two candidate target features, but one of the target features has matching attribute values and the other doesn't, then the former is chosen as the final match. The condition of attribute match affects the level of confidence of the feature matching. SRC_FID—The source feature ID. The value is -1 for an unmatched source feature. TGT_FID—The target feature ID. The value is -1 for an unmatched target feature. 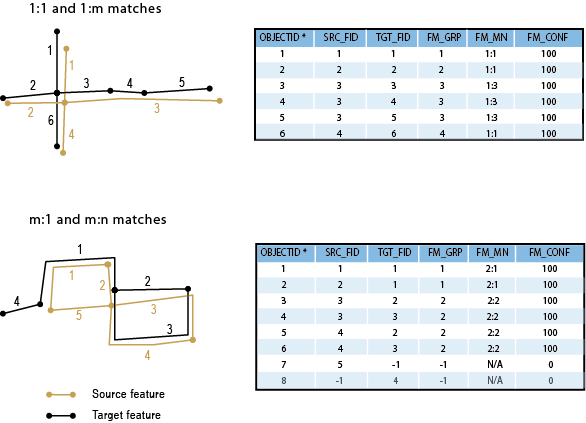 FM_MN—The match relationships between source and target features in the format of m:n, where m and n are the number of source features and target features in a match group, respectively. For example, 1:1 is a one-to-one match; and 3:2 a three-to-two match. For unmatched source or target features, the value in this field is N/A for not applicable. The next section has example feature matching scenarios and the matching information in the match tables. For simplicity, attribute match is assumed for all matched features, reflected in FM_CONF value of 100. One source feature matches one target feature; they belong to the same match group. One source feature matches multiple target features; all of them belong to the same match group. Multiple source features match one target feature; all of them belong to the same match group. Multiple source features match multiple target features; all of them belong to the same match group.